Inuktitut: Piruqtut nunaralikuluit (Baffin Island), Piruqtut nunaralikuluit, anurisutik (Nunavik). Published in Sp. Pl. 141. 1753. Type: Described from northern Sweden ("Alpibus Lapponicis"), selected by Barrie, in Jarvis et al., Regnum Veget. 127: 42. 1993. Lectotype: LINN 195.1. Vegetative morphology. Plants 1–5(–8) cm high; shrubs (small plants easily misinterpreted as herbs); dwarf shrubs. Roots pallid-brown. Aerial stems branching from a tap at or near ground level into two or more branches; erect (branching beneath the recent season's leaves in older tussocks with an accumulation of duff amongst the branches), or prostrate (occasionally, as when a plant is growing under a rock and sends a stem underneath which develops a small cushion at the tip). Leaves distributed along the stems; whorled (in dense ascending, compact whorls); persistent. Petioles absent. Leaf blades simple (yellowish green in upper portion, pale at the base in summer; dark burgundy in winter). Leaf blade bases truncate. Blades 5–15(–20) mm long, 0.5–3 mm wide, divaricate, oblong or spatulate, flat, appearing single-veined. Blade adaxial surface shiny, glabrous. Blade abaxial surface glabrous. Blade margins slightly revolute. Blade margins entire, with glandular hairs; apices obtuse, or rounded. Reproductive morphology. Flowering stems without leaves (The illustration in Porsild (1957) and Porsild and Cody (1980) shows leaves on the scape, but we have not been able to confirm the presence of such leaves (Peter Scott, personal communication, 1999)). Flowers solitary (or 2–3). Involucral bracts present. Flowers medium-sized. Sepals conventional; 5; free; 2–4 mm long; 5–6 mm wide; green (yellowish or pinkish); leathery (slightly). Calyx glabrous. Petals conventional; fused (for half their length; corolla appearing deeply lobed); 5; white (or cream or rose, or light pink petals are known for this species from Newfoundland and for subsp. obovata from Alaska and Japan); 0.8–1.4 mm long. Corolla tubular (fused base of the petals), or rotate (free petal lobes); 5-lobed. Stamens 5 (alternate with the petal lobes); stamen filaments glabrous; fused to the corolla (between each petal). Anthers yellow; 0.7–0.9 mm long (entrose anthers, on broad, flat filaments). Nectaries absent. Ovary superior; carpels 3; syncarpous. Styles 1. Stigmas per ovary 1 (sometimes with 3 lobes at the apex). Placentation axile. Ovules per ovary many approximately 240. Fruit stalked; with calyx persisting; dry; a capsule; ovoid; brown, or red (pale pinkish or yellowish); 2–3 mm long; 1–2 mm wide; dehiscent. Seeds 25–130; 0.7–1.1 mm long (tetrahedral in shape); brown (pale cream under a conspicuous tan brown reticulation on the surfaces); surfaces ridged (seedlings rarely seen). Chromosome information. 2n = 12. 2n = 12. Samuelsson (1913, northern Europe); Hagerup (1928, Greenland? ); Baldwin (1939); Sørensen and Westergaard, in Löve and Löve (1948, Greenland); Löve and Löve (1956, Iceland; 1966, northeast USA; 1982a, central Canada); Jørgensen et al. (1958, Greenland); Sokolovskaya and Strelkova (1960, 1962); Dalgaard (1989, western Greenland). Phenology. Phenology: Flowering in June-July. Pollinated by members of Diptera. Taxon as an environmental indicator. Chionophobic, that is, it does not like snow so tends to grow in wind-swept habitats. Ecology and habitat. Substrates: tundra, slopes, ridges; imperfectly drained moist areas (less commonly), dry; rocks, gravel, silt (runoff banks); with low organic content; acidic (often found on Precambrian materials, rocky ledges or gravel). 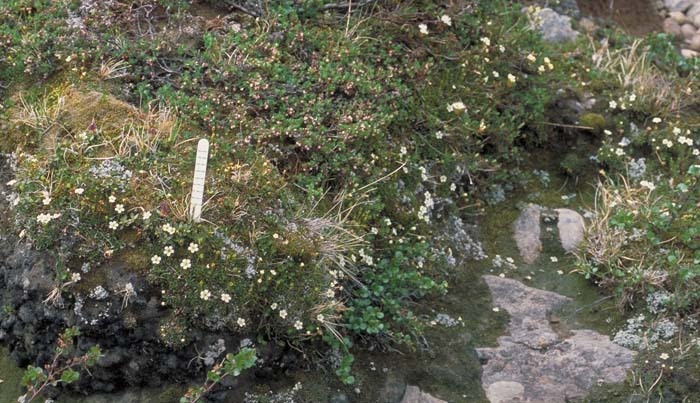 A plant of dry exposed habitats, D. lapponica has been reported with ericaceous shrubs in the Arctic islands. 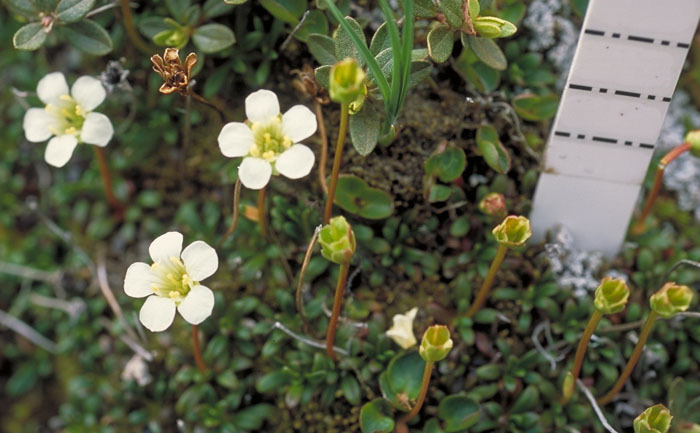 The streamlined heat and nutrient-trapping growth form allows this species to grow in exposed arctic-alpine habitats. North American distribution. Nunavut Islands, continental Nunavut, northern Quebec, Labrador. Range in the Canadian Arctic Archipelago limited. Uncommon. Low Arctic. Arctic islands: Baffin, Southampton (and Coats). Northern hemisphere distribution. Amphi-Atlantic (replaced by subsp. obovata in the amphi-Beringian areas). Northern Iceland, Northern Fennoscandian, KaninPechora, Polar Ural  Novaya Zemlya, YamalGydan, Central Canada, Labrador  Hudson Bay, Ellesmere Land  Peary Land, West Greenland, East Greenland. Economic uses. Diapensia is not of economic importance as yet. However, the oils in its tissues may some day be of value (Bliss 1962). Diapensia is a very desirable garden plant, but attempts at cultivation in lowland locations usually fail. General notes. 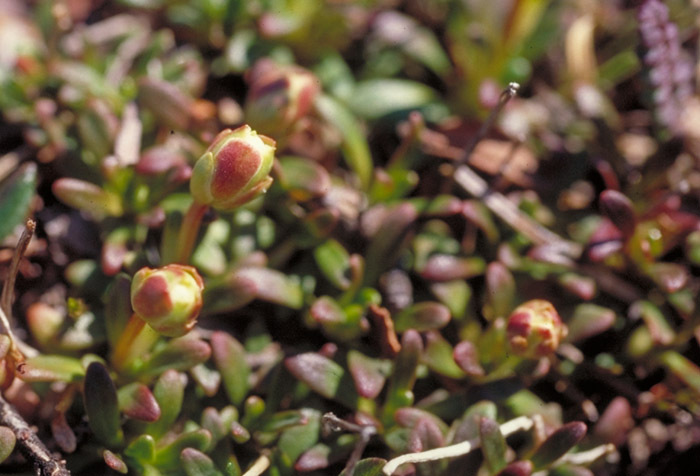 In Newfoundland and New England, plants have been found to bloom in June or August. It is thought that this phenology produced seeds in the autumn, which are less likely to be parasitised by fungi. 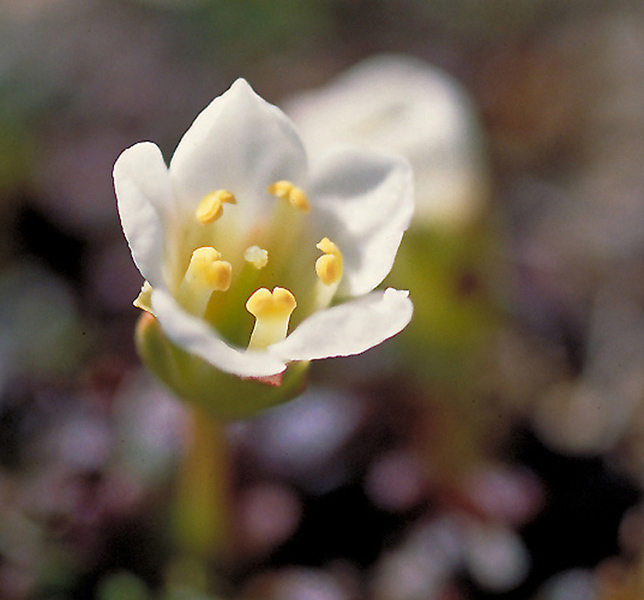 Diapensia lapponica has subspecies lapponica and obovata, which have distinct distributions. Subspecies lapponica is found in eastern North America from New England to Baffin Island and in Greenland, Iceland, Scotland, Scandinavia, and the western Soviet arctic and subarctic. 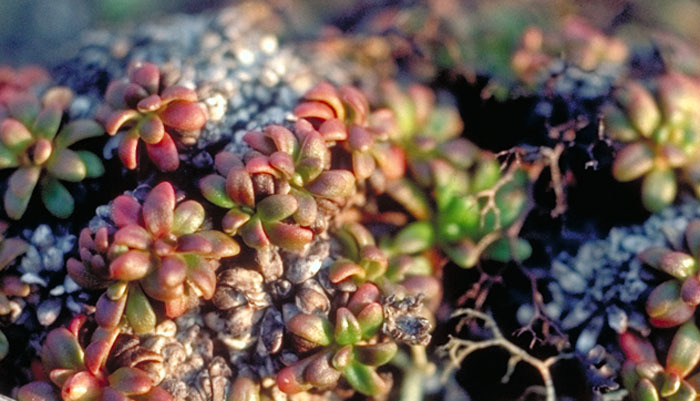 Subspecies obovata is found in eastern arctic and subarctic Siberia, Korea, Japan, Aleutian Islands, Alaska, and the Yukon. Subspecies obovata has obovate leaves, while those of subsp. lapponica are narrowly spatulate. Subspecies obovata has a more 'sprawling' growth form, not usually forming distinct small tussocks. Leaf length/width ratios are subsp. lapponica 2–2.5, susbp. obovata 2.75–2.8 (Day and Scott, 1981, Scott and Day 1983, Day and Scott 1984). 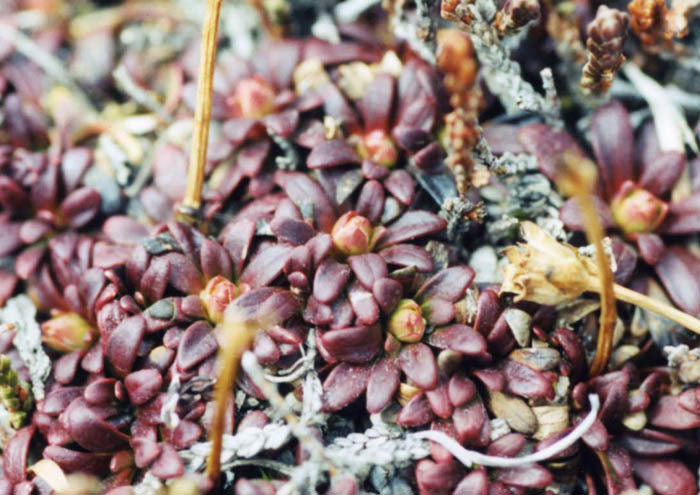 Marchand and Roach (1980), in a study of reproductive strategies of pioneering alpine species seed production dispersal and germination, found that D. lapponica lacked the above characteristics and was much less opportunistic in reproductive behaviour than other species studied. Illustrations. • Habitat. Cushion plants with white flowers growing beside the bank of a run-off channel with bilberry and sedge. Nunavut, Baffin Island, near Mt Joy. Aiken and Iles 2002. No voucher. 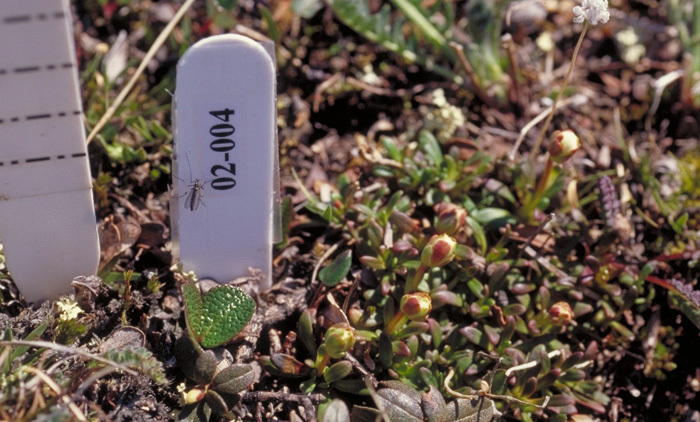 • Plants growing with Empetrum. 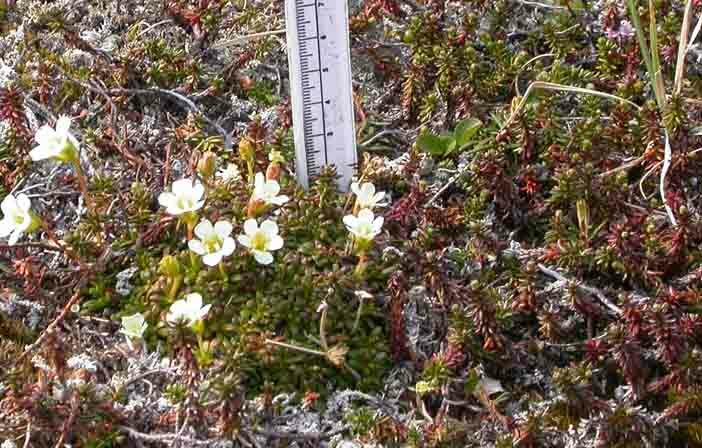 Plants growing with Empetrum in exposed tundra. Nunavut, Baffin Island, Ogac Lake. Aiken and LeBlanc 2004. No voucher. • Plant in bud. Cushion plants barely 2 cm high coming into flower. Nunavut, Baffin Island, Iqaluit. Aiken and Mallory 02–004. CAN. Scale bar in cm. • Close-up of buds. Buds with two layers of involucral bracts. The outer bracts, green, short and narrow. The facing inner bract is reddish, twice as wide as the outer bract and flat. Inside, there is a pale green calyx. Nunavut, Baffin Island, Iqaluit. Aiken and Mallory 02–004. CAN. • Close-up of plant. Left, plants in flower. Right, plants beginning to set fruit and with petals absent. Nunavut, Baffin Island, Soper River Valley, Mt. Joy. Aiken and Iles 2002. No Voucher. Scale bar in cm. • Side view of flower. Flower with green calyx that is much shorter than the five white petals, anthers attached to the fused base of the petals and alternate with the petal lobes. Note the central stigma. Aiken and Mallory 02–004. CAN. • Close-up of involucral bracts. 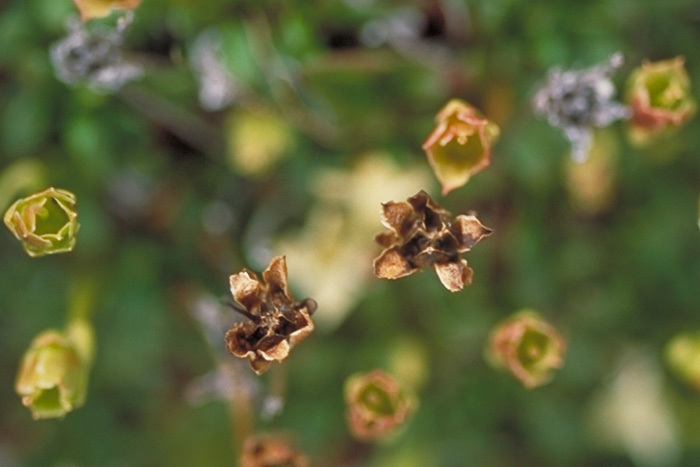 Involucral bracts below a flower setting fruit. Nunavut, Baffin Island, Apex. 24 July, 2005. Photograph by Kathy Thornhill. • Surface view of fruits. Centre, dark brown, dehisced capsules of previous season's fruits that have split to show axile placentation and layers of involucral bracts. Left, ripening current season's fruit. Nunavut, Baffin Island, Iqaluit. Aiken and Mallory. No Voucher. • Close-up of leaves in fall. Tiny shrub plants with orange-green leaves that are compact, ascending and whorled. Nunavut, Baffin Island, Iqaluit. 19 July, 1982. J.M. Gillett 18957. • Close-up of leaves in spring. These evergreen leaves lose their green colouration over the winter and turn red. 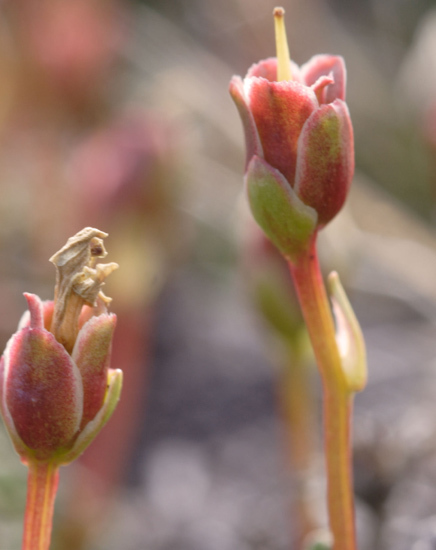 The following spring, these leaf buds are beginning to expand and show some early green colouration. Photograph by Carolyn Mallory spring 2003. No voucher. • Arctic Island Distribution.